Hope you are all doing well? I wanted to test out a post today, as I'm thinking about doing a few mini wishlist posts for the blog. I'm starting my new full time job soon and want to make sure my content is still regular for you lovelies. I know it will take me a while to find my "flow" but I thought that a wishlist style post would be a great way to show you what products I'm lusting after right now. I would love to know what beauty products you are currently lusting over? and if you have tried any products from my wishlist, I would love to know if you think they are worth buying! I have had this on my wishlist for a little while now! it seems to be a "must have" for a lot of my favourite beauty bloggers and youtubers! especially Viviana Does Makeup (Who I adore) - I'm a huge fan of the Estee Lauder ANR and this seems quite a similar product, which is why I have put off buying this for a while. However, it's something I know sooner or later I will give into and purchase haha! has anyone else tried this? I pretty much LOVE NEOM as a brand, as I just find there service and products to be truly outstanding. I'm not the best sleeper and I think that this set would be perfect to help relax me when I start my new job next week. Plus this gift set saves you £20.50 in comparison to buying the single products that would work out a lot more expensive! 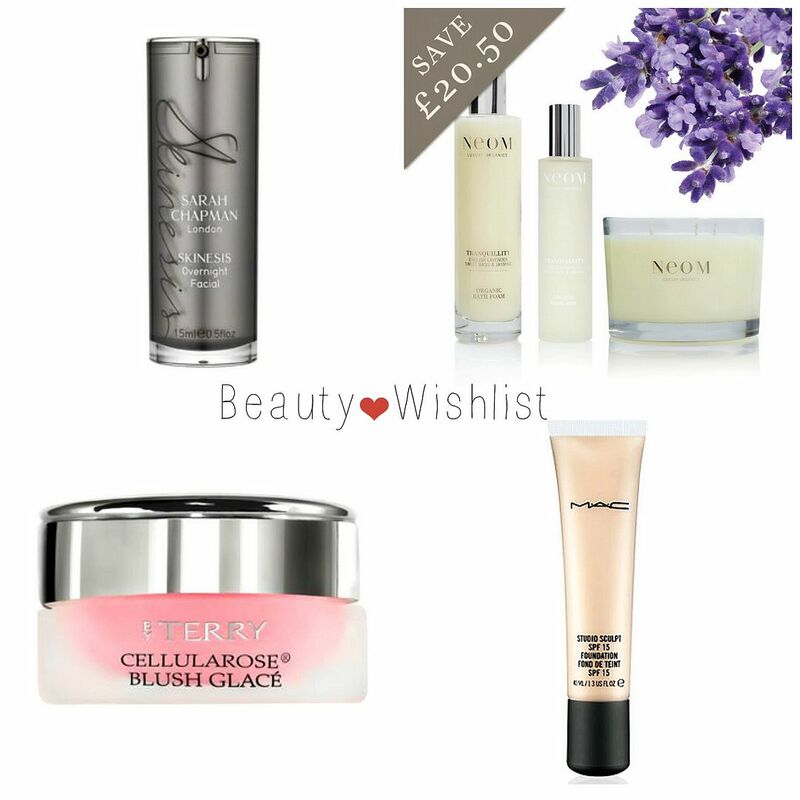 After making some cheeky Hourglass purchases, I found my self loitering around on the Space NK website! I have never purchased anything from "By TERRY" and when I seen these blushes I was instantly wowed. I think Rose Melba looks good enough to eat in this picture, so this little beauty has definitely made its way onto my wishlist. I must admit I feel like I'm missing out a bit as I haven't tried a MAC foundation yet! I have always loved light coverage foundations from Chanel and YSL and I have always had this image of MAC foundations being too thick for what I like! However, after working at the spa which is very busy I have learnt to appreciate more medium/full coverage foundations for work days! It's so nice to go to work with a flawless base and know it will last, so I think I'm going to give the Studio Sculpt a whirl soon! I hope you have enjoyed this short but sweet post! I want to try and mix things up a little so expect more personal posts, beauty series, wishlists, lifestyle and more! - I love hearing from you, so if you ever need any help or advice then don't hesitate to contact me via my Social Media Icons! I haven't tried Mac foundations either! Mac Studio Sculpt and Studio Fix Powder have been on my wishlist for awhile now, I'll pick them up soon!